Few restaurant openings have had the buzz that Dinner has had in the past year. Foodies have been collectively freaking out ever since it was announced that Heston, *the* Heston, would be opening up his first restaurant in 16 years right smack dab in the middle of London, and with good reason – it is pretty damn exciting. In a word, yes. Though not the dining experience I would imagine his three Michelin star The Fat Duck to be, Dinner is excellent. I wouldn’t call it earth-shattering, but from beginning to end, there were a lot of ooh’s and ahh’s at our table. I dined there with my pal, Gary, for what was I thought going to be a posh, but competitively priced 3-course lunch for £28. It turned out, however, that deal is only available Monday through Friday, which meant while we got to choose from the whole menu, we also had to pay quite a bit more than we thought. Starters were in the £10-£15 range, mains around the £30 mark and desserts about £8-10. Expensive, but fairly standard for a restaurant in the Mandarin Oriental hotel (home of high-class escorts and £19 martinis, it would also seem). Now I generally don’t write about my drinks, but this one was too tasty to pass up. 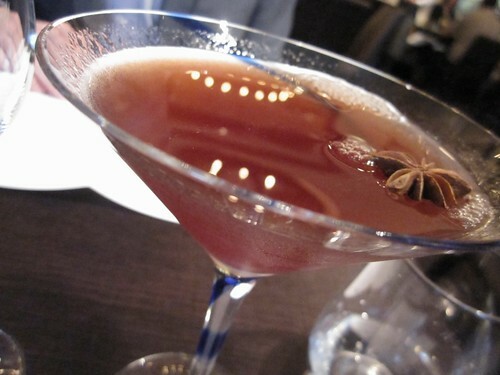 Rhubarb puree, persimmon and a drizzle of cinnamon syrup with the smoothest vodka. You could easily drink this down in one gulp. 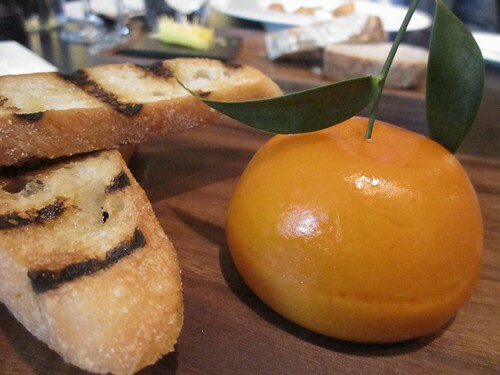 Starting out with food, I couldn’t pass up the Meat Fruit (£12.50) of ‘mandarin, chicken liver parfait and grilled bread’ that I’d heard so much about. Looking suspiciously like an extra vibrant tangerine, I was almost giddy to cut into it. 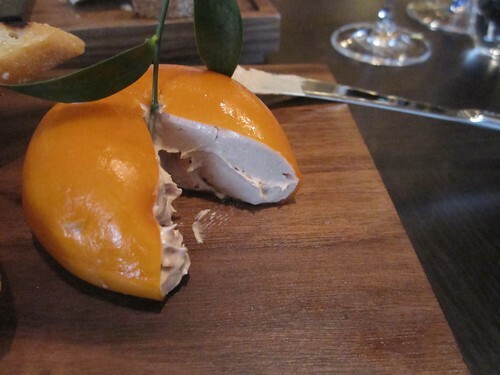 The skin, revealed to be more like a jelly, was supple, giving way to the most silky, richest parfait I’ve ever had. It was unique, fun and it lived up to the hype. 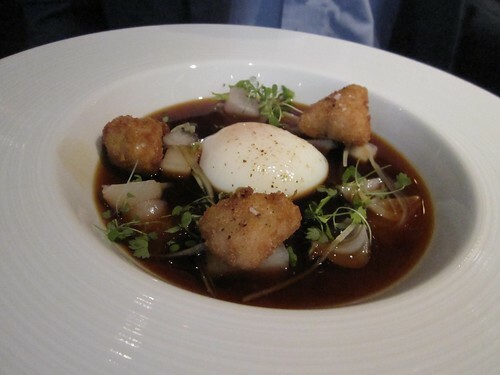 This dish of lightly fired sweetbreads, celery, radish, turnip and a hen’s egg was amazingly aromatic. The array of textures and flavours were nearly over-powered by the rich broth, but they somehow managed to hold their own. Long-time readers will know that I have a soft spot for those ugly birds ever since I tried it at my first time at St John, and this was no exception. Served as four boneless strips alongside artichokes with an ale-based sauce, it just about melted in my mouth. The very definition of tender. I wish I caught what sauce the duck was served with. 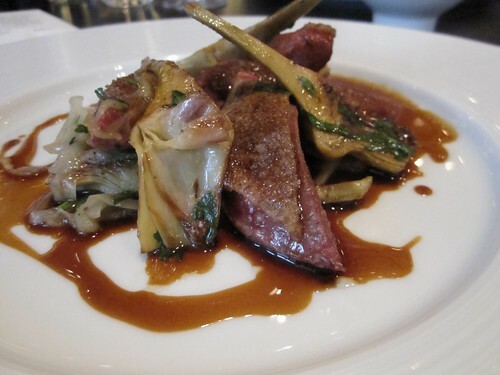 It was slightly sweeter than the pigeon’s ale sauce – and drizzled over the smoked fennel the duck was served upon, it was absolutely perfect. 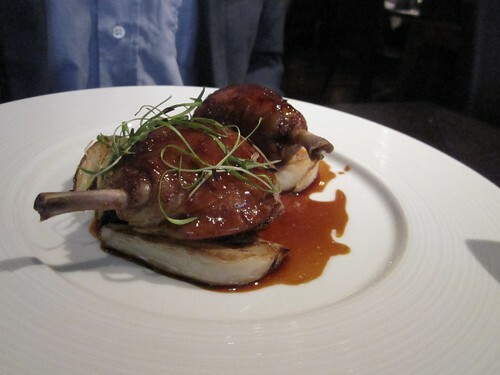 The duck, looking more like miniature legs of lamb was tender and nicely spiced. On to desserts, and this is where Dinner really shined. 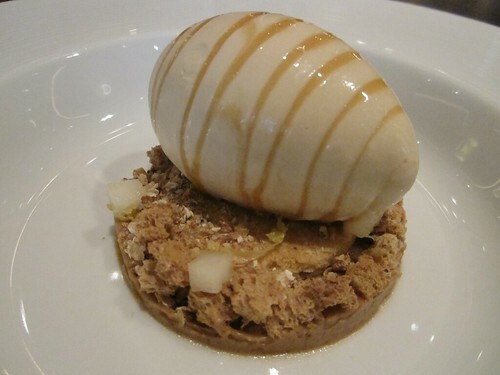 I knew at first glance that I was going to go with the Brown Bread Ice Cream (£8.50) if not just because of the ‘salted butter caramel syrup’ it was served with. Salted caramel is food of the gods. Period. 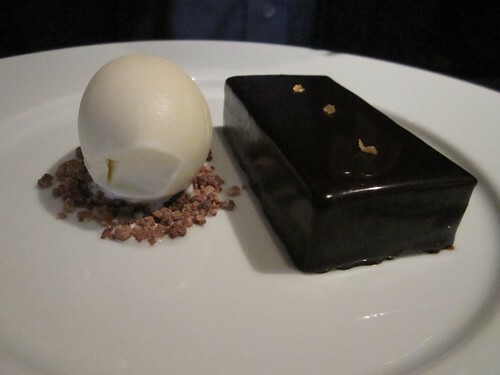 The rich dark chocolate was so shiny you could actually see your reflection, Gary commented on his second bite, ‘This is so good, it’s hard not to break into a smile when you eat it’. So, there you have it – a success. The final surprise of the our posh lunch was the petite four, which wasn’t really a petite four at all. Described as an Earl Grey Vanilla Ganache and Caraway Seed Biscuit, it didn’t look like much, but heavens did it pack a punch. 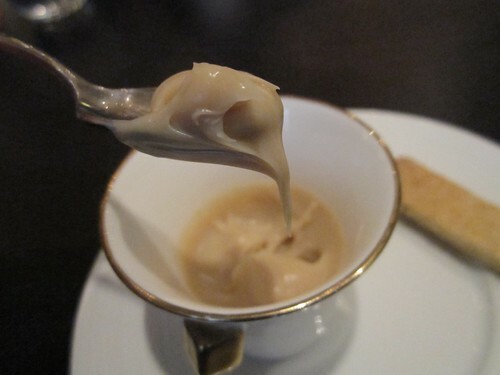 Just look how thick and creamy! Had it not been completely inappropriate, I would have tried to lick the inside of the cup. By this time, my stomach could take no more, and we asked for the bill. It hurt. A whopping £170 total for lunch. We split it down the middle, and tried not to wince as we punched in our respective pin numbers. Not the kind of thing I’d do all the time, but every once in a while, it’s worth it. Service was perfect, and honestly there’s not a whole lot I can fault with the whole experience. The place is absolutely beautiful too. Even £85 lighter, I’m a happy camper.